Published in association with the Royal Geographical Society with the Institute of British Geographers. 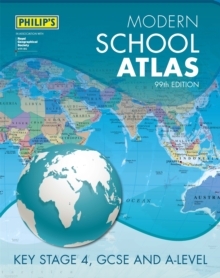 - Britain's best-selling school atlas - now in its 99th edition - Recommended for Key Stage 4, GCSE and A-level in England and Wales (Scottish National Qualifications/Highers) - and for international schools. - Updated for 2019 to reflect the latest changes in the curriculum - Published in association with the Royal Geographical Society - New edition combines superb digital maps of Britain and the world with up-to-date thematic maps across a wide range of themes - 184 pages of essential learning including political, physical, climate and thematic mapping - 32-page section on Britain and Ireland with a wide range of thematic maps - Country-by-country statistics on population, land use, trade, tourism, energy, wealth and much more - World Themes Section - from volcanoes and earthquakes to population trends, languages and religions, all the key aspects and statistics of geography are explored and explained - Plus a special 7-page section on how satellite imagery is used to interpret global, environmental and urban patterns of change Britain's best-selling secondary school atlas, now in its 99th Edition. The contents are divided into sections for ease of use, with each page colour-coded for rapid reference. A special Remote Sensing section covers such topics as satellite imagery and GIS. The next section covers the United Kingdom and Ireland in 30 pages. Accompanying the physical maps are thematic maps on numerous key social and economic themes. The middle section is made up of 74 pages of World topographical maps, incorporating continental thematic maps on topics such as climate, population and economics, followed by 30 pages of World thematic maps. Completing the atlas is a section of World social and economic statistics, accompanied by the index to the topographical maps in the atlas, showing letter-figure grid references as well as latitude and longitude co-ordinates. Available in both hardback and paperback formats, Philip's Modern School Atlas 99th Edition is an unbeatable combination of highly detailed physical mapping backed up by numerous tables and thematic maps.